St. Martin about St. Brice: "If Jesus could deal with Judas, I can deal with Brice"
Today Mother Church celebrates the feast day of St. Brice of Tours along with St. Francis Xavier Cabrini. More on the latter one later. 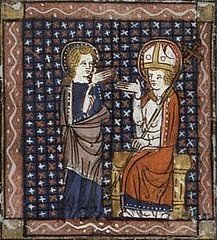 I love the story of St. Brice, born in 370. As a child, he was an orphan for some time before St. Martin of Tours agreed to take him in and raise him in the monastery. As Brice grew older, the two did not get along with one another. We don’t know how much of it was “playful” dislike and how much was serious dislike, but it was well known that the two butted heads often. Interesting, isn’t it, how God can put two saintly people in close proximity to each other who at the same time can’t stand one another. Each was holy but not in the same ways. Each has a room in the house of saints in heaven, but I bet they’re in different wings. St. Brice of Tours: Pray for Us! ← "The Holy Spirit will haunt you"